The choice to be more productive and time-efficient is always the right choice – but how do you make it a reality? Here are the best and most popular books on productivity, with tips, tricks, hacks, and advice that will help you streamline your work routine, have more free time, minimize time wasters, and reach your goals. Who’s it for? Those interested to experiment with various productivity tactics to find the most effective one. What’s it about? The Productivity Project offers the insights Chris Bailey gathered through a number of unusual productivity adventures he went through in a year. Each experiment had a certain impact on his work, in terms of quality and quantity – Bailey singles out the 30 practices that he found to work the best. Who’s it for? Everyone who wants to form good habits or lose bad ones. What’s it about? If you’re having trouble changing your habits, the problem isn’t you. The problem is your system. Bad habits repeat themselves again and again not because you don’t want to change, but because you have the wrong system for change. You do not rise to the level of your goals. You fall to the level of your systems. Here, you’ll get a proven system that can take you to new heights. What you’ll learn? You will learn how to make time for new habits (even when life gets crazy), overcome a lack of motivation and willpower, design your environment to make success easier, and get back on track when you fall off course. Who’s it for? People looking for new, alternative solutions to traditional business formulas such as making a business plan, studying the competition, seeking investors, and the like. What’s it about? 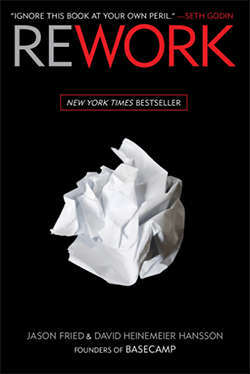 Rework takes old business formulas and explains why you need to rework them – Fried and Hansson explain why plans are harmful, why investors may be unnecessary, and why it’s best to ignore the competition. What you’ll learn? You’ll learn why a simple work routine (with minimized paperwork, meetings, and the time spent at work) is always best, and why you don’t even need an office or staff to succeed. This book will also show you why to challenge everything you think you know about business. Who’s it for? Anyone who can’t go 5-10 minutes without checking his or her email, despite knowing most of it is a waste of time. What’s it about? 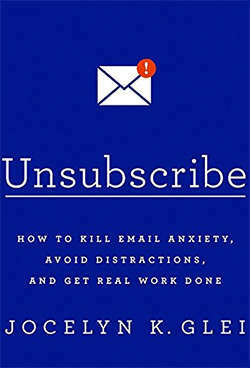 Unsubscribe shows how you can make better use of the 13 hours per week you usually spend on emails and find a way to focus on priorities. Although the book offers a number of email tips and tricks, it’s not just about that – it also explains how you can deal with problems in communication, improve your writing, and establish a reward system that will help you move forward with your work. Who’s it for? For those who want to learn how to focus without distraction on cognitively demanding tasks, but fear that their attention span is short-lived. Shallow work can be performed despite distractions, or as a result of them. It’s easy to replicate, but not truly valuable. 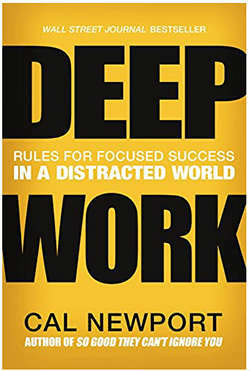 Deep work is more focused work, performed free of distractions. It needs practice and effort but is much more important to achieve. What you’ll learn? The second part of the book offers a training regimen meant to help you cultivate deep work – you’ll learn the 4 rules that will help you transform your mind and adopt this skill. Who’s it for? Anyone interested to know how the great minds of famous novelists, playwrights, painters, scientists work. What’s it about? 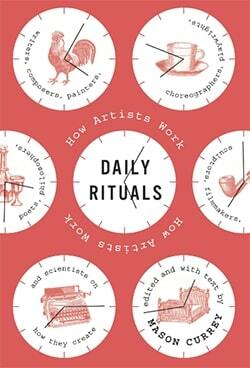 Daily Rituals presents the readers with 161 inspiring people and their daily rituals – some were odd, some unusual, some downright bizarre, but all were vital in making them successful. What you’ll learn? You’ll learn about the habits that shaped and shape great minds from the past and present – you’ll learn why Igor Stravinsky insisted on an audience in order to compose, why Thomas Wolfe insisted on writing standing, and how much time Mozart spent on his music every day. The book also covers the daily rituals of Kafka, Beethoven, Agatha Christie, Woody Allen, Andy Warhol, Jane Austen, and many more. Who’s it for? Everyone who wants bite-sized productivity tips from the top 1% performs in any given field. What’s it about? 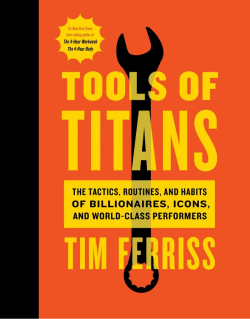 Tim Ferris has over 200 podcasts where he interviewed celebrities, athletes, entrepreneurs, and scientists. This book is a compilation of the best pieces of advice, as well as tips and strategies on how to improve your life and productivity. What you’ll learn? You’ll learn a lot of interesting stuff, like how to create a real world MBA, tactics for dealing with haters, what books famous people read, what’s the one thing they wish they knew at the start of their careers, and more. Who’s it for? Anyone struggling with how to prioritize tasks, and single out the most important assignments. What’s it about? Eat That Frog! 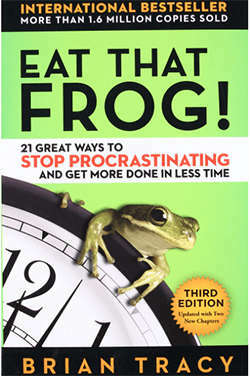 explains how you can prioritize tasks, by illustrating the problem with frogs – your most urgent, important, or unpleasant task is the biggest, ugliest frog in your pond. To call your day a success, “eat that frog” first – once you’ve finished with this task, you’ll know that the worst is behind you, so you’ll be able to tackle your remaining tasks with ease. What you’ll learn? Tracy offers 21 tips and strategy that will help you learn how to get more work done, but in the right, priority order. The first chapter explains how you can use technology to keep an eye on your priorities. The other offers advice on how you can avoid distractions that keep you away from your work. Who’s it for? Those who feel like they rarely make their own choices, who feel overwhelmed with work, who are constantly busy, but rarely productive. People who always underestimate the time it takes to finish something. What’s it about? 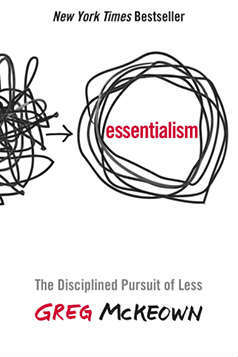 Essentialism: The Disciplined Pursuit of Less twists the old “do more in less time” productivity formula and proposes that you should only do the important stuff. By only focusing your energy on select essential tasks, you’ll regain control over your time, and start making your own decisions and choices. What you’ll learn? McKeown shows how you can identify and focus on the essentials, eliminate trivial tasks, as well as put your own priorities first, in order to move forward with your own goals. Who’s it for? Artists looking to succeed in a creative field of work and beat their own insecurities. What’s it about? The War of Art gives advice on how to recognize your procrastination process and offers aspiring artists insight into how they can bridge obstacles in their creative work. What you’ll learn? Whether you’re a writer, screenwriter, painter, or any other type of artist, this book will show how you can make your dreams a reality through dedicated work, and by treating your dreams as a full-time job. 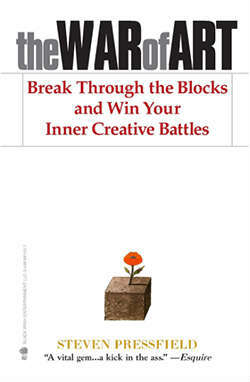 This book will also show you how and why focusing your full attention to one particular field of creative work will bring you the most benefits. Who’s it for? Anyone looking for motivation to finish their intended tasks, and anyone looking to organize their workdays in a straightforward manner. What’s it about? Getting Things Done is a classic among productivity books – and the all-new updated version only builds upon a number of great advice you can practice. This book teaches you how to set up an effective system of reminders and lists, to help you stop thinking about what tasks you need to do, and instead actually do them. What you’ll learn? You’ll learn the concepts of the “collection bucket” and “next actions list”, as well as why you should start small, how to make work interesting, and how you can find productivity practices that work for you. 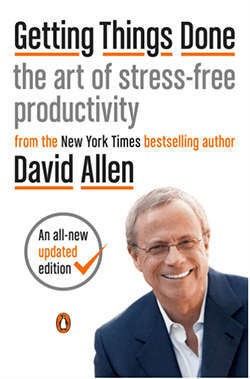 When writing this updated version, Allen adjusted the original book from 2002 to fit with the modern world rules, so he added new material that modernizes his original advice. Who’s it for? People interested to understand why they do what they do, and everyone who’d want to have more willpower in resisting bad habits. What’s it about? 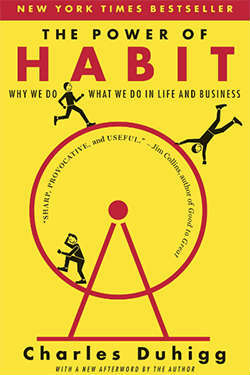 The Power of Habit offers scientific explanations on why we have certain habits, and how we can overcome them. You’ll discover neuroscientific explanation how habits work in general, as well as learn how certain keystone habits can bring you success. What you’ll learn? The book tackles habits through a number of interesting narratives – you’ll learn how you can transform your life and work, through key takeaways from the habits of successful people. Who’s it for? 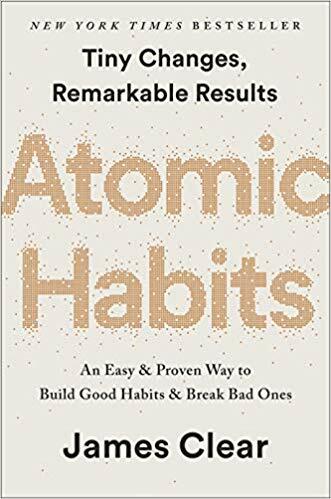 People who’ve already understood why they do what they do by reading The Power of Habit, but now what to know how to improve on what they do. What’s it about? 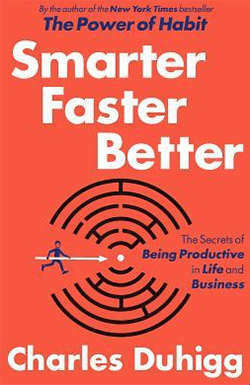 Smarter Faster Better uses the latest neuroscience, behavioral, psychological research to show why controlling how you think is more important than controlling what you think. What you’ll learn? In his second book from this list, Duhigg talks about the 8 productivity concepts that clarify why some people manage to get a lot of work done – motivation, setting goals, making decisions, and focusing on a task at hand are some of the concepts you’ll learn more about. 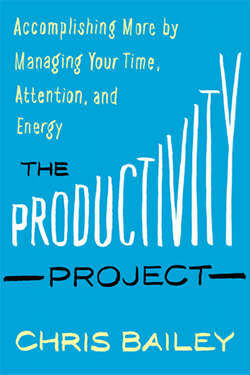 This book illustrates its points through many real-life examples and informative reports, so you’ll get vivid explanations for why your own choices and decisions determine your productivity, and how to improve on your work. Who’s it for? For anyone struggling with decisions in everyday life. What’s it about? 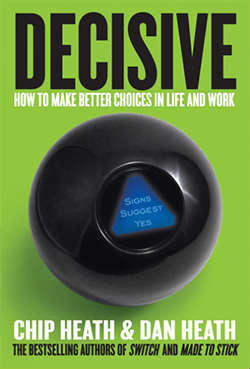 Decisive guides you through a large number of scientific studies, insightful stories, and extensive research while highlighting functional tools that can help you consider your options and choices with more thought. What you’ll learn? Chip and Dan Health offer 4-step process to help us overcome our biases, irrationalities, and the general overconfidence that pushes us to make decisions based on information that supports our beliefs while ignoring the information that doesn’t. Who’s it for? Anyone who’s having trouble saying “no”, taking responsibility in life, identifying personal goals, listening to, or cooperating with others. What’s it about? 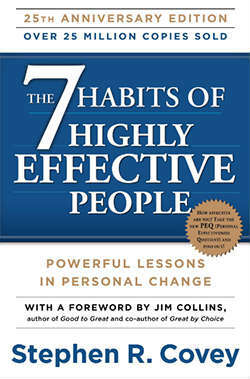 The 7 Habits of Highly Effective People are another classic among productivity books – it offers 7 habits you can replicate in an effort to be more productive and effective. be proactive, and take responsibility in your life. begin with the end in mind, and visualize what you want to achieve with certain actions. put first things first, and say “no” from time to time, to put matters in perspective and focus on your priorities. think Win-Win instead of win-lose, and look for mutual benefits in all your interactions with other people. seek first to understand, then be understood, and listen actively to others. synergize and cooperate creatively with your team. sharpen the saw, and maintain steady growth and healthy change in your life, to keep you fresh for tackling the previous 6 points. Who’s it for? Anyone who believes people are stuck with the same abilities they were born with, for the rest of your life. What’s it about? The Mindset shows why you shouldn’t view your talents as fixed assets you can no longer improve on and explains how you can cultivate a “growth mindset” instead. What you’ll learn? You’ll learn how to change your thought processes to recognize your potential to grow your talent, abilities, and skills. 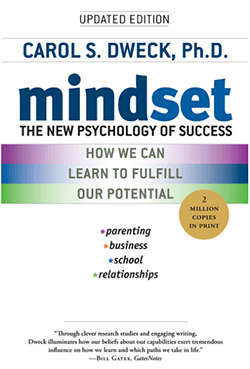 The newest edition of the book also proposes a new twist to Dweck’s original concept from 2007 – you’ll learn what “false growth mindset” is and how to implement it to develop a more meaningful, profound “growth mindset”. Who’s it for? Anyone having trouble focusing on one thing at a time. What’s it about? 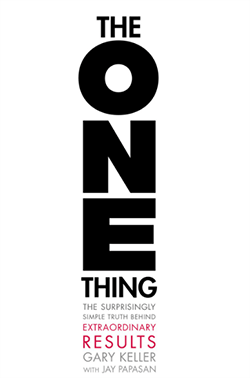 The One Thing provides a straightforward approach to productivity, that asks the question – What is the one thing most important to you at the moment? What you’ll learn? You’ll learn how to feel less stressed, how to minimize distractions and declutter your workload, as well as be more focused and energized to tackle a task at hand. Keller and Jay Papasan also help you identify your short-term and long-term goals, teach you how to efficiently say “No” to extra work, and show the best ways to keep a work/life balance. Who’s it for? Anyone who keeps promising to go to the gym more often, try new hobbies, or reach certain work goals, but never seems to get around to. What’s it about? 168 Hours: You Have More Time Than You Think shows how you can find time to work, spend time with family and friends, and your other priorities, but also sleep 8 hours a day, exercise regularly, and even make time for a new hobby. What you’ll learn? 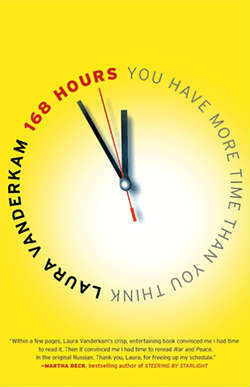 The book explains why and how successful people manage time better than others – focusing only on a small number of important priority tasks is the key concept, and Vanderkam talks about it in detail. Who’s it for? People who make lists of what they need to do for the day, but don’t know what they want to achieve by finishing said lists. What’s it about? 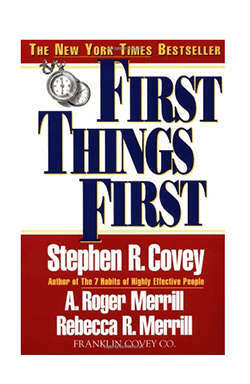 First Things First shows how you can stop abiding to to-dos, schedules, appointments and understand what your goals, values, and principles in life really are. What you’ll learn? You’ll learn how to focus on what’s important in your life (and not just on what’s urgent), how to visualize what you want to achieve, and how to cooperate with people to reach the results you want. Who’s it for? Anyone who wants to take control of their time and attention. Do we need to work constantly? Do we need to put other people’s priorities in front of ours? What you’ll learn? 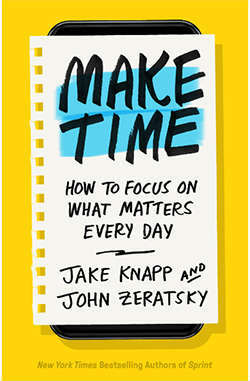 This book includes Knapp’s and Zeratsky’s best tips and tricks on how to stay focused, energized, and time efficient. Instead of one universal solution, they offer advice that can be tailored to fit the needs and problems of individuals. You’ll learn how to stop going with the flow and playing by the rules of the modern world, and how to make time for your own priorities. Who’s it for? Anyone who still hasn’t realized the importance of attention and focus in work and private life. What’s it about? Focus: The Hidden Driver of Excellence highlights “attention”, or “focus”, as a means to succeed in a world filled with distractions. 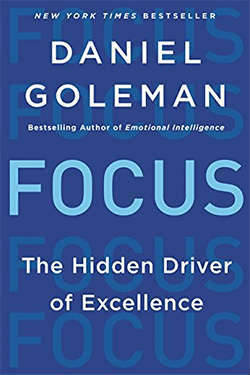 Goleman divides focus into “inner”, “other”, and “outer focus”, and shows why and how you need all three of them to be a high-performer. What you’ll learn? You’ll learn why you should practice mindfulness, increase your willpower, improve your leadership qualities, and have high empathy, all to reach success. You’ll also learn how to plan your future better by thinking about your distant problems now.